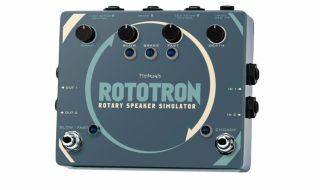 NAMM 2014 PRESS RELEASE: January 21, 2014 (Anaheim, CA) - Pigtronix has unveiled the Rototron, an all-new rotary speaker simulator effect that achieves unsurpassed 3D realism in a compact, easy-to-use pedal. Designed by effects gurus Howard Davis and David Koltai, the Pigtronix Rototron accurately recreates the complex acoustic phenomenon of the legendary dual-rotor 122 and 147 Leslie cabinets as used by Peter Frampton, Danny Gatton, the Beatles and many others. Independent Slow and Fast speed controls with adjustable ramp time allow musicians to enjoy the mesmerizing sound of speeding up and slowing down an actual rotary cabinet. A remotely switchable Brake function completes the authentic experience, while independent expression pedal jacks for the low and high rotors enable some entirely new variations on psychedelic bliss---without the back-breaking hassle. "The obscure, German-made Dynacord CLS-222 rack unit, most famously used by Pink Floyd's David Gilmour on the Division Bell tour, has been the closest anyone ever came to sounding like the real thing... until now," says sound designer and company president, David Koltai.